Super Durable RALs — Powder Technology, Inc.
Powder Technology, Inc. is proud to announce that we have expanded our product offering to include over 135 RAL colors. Every coating in our RAL product line is UL Listed*, High Gloss, Super Durable Polyester TGIC, well surpassing the American Architectural Manufacturers Association 2603 Standards. Designed for uniform application properties and superior opacity levels, these coatings cure at a temperature of 350°, allowing for energy savings versus many other standard cure product lines. In addition, all of our RAL coatings are high gloss, with ratings of 85+. Using our ATP primer plus our Super Durable top coat we typically see more than 5,000 hours in salt spray cabinets. We can also supply many of these RAL coatings to meet rigorous AAMA 2604 and AAMA 2605 Standards using our Pentabond and Decabond chemistry. Formulated with the highest performance ingredients available, our Decabond coatings deliver proven track records, maintaining superior durability and a minimum of 50% gloss retention after 10 years Florida exposure. 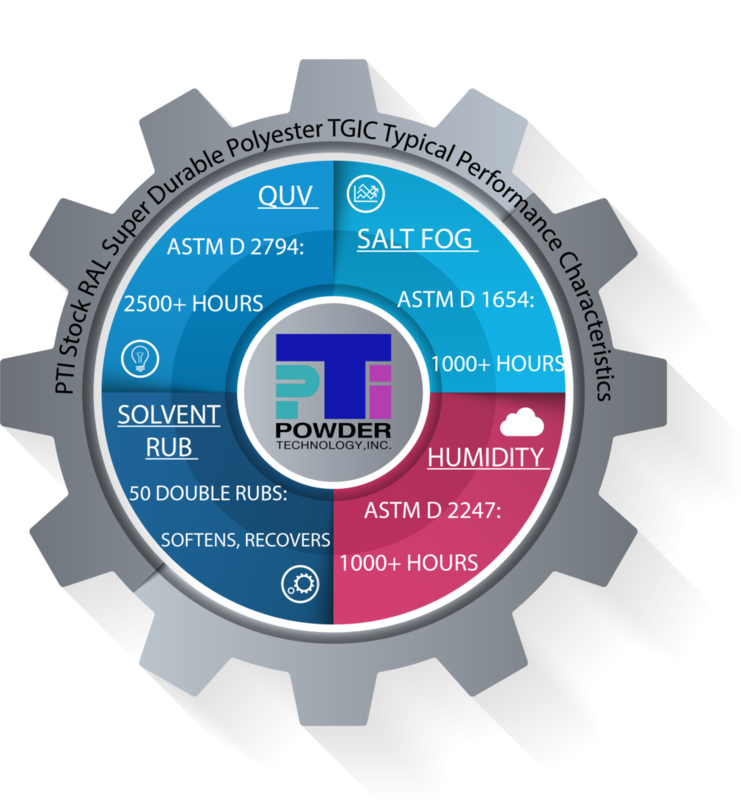 Powder Technology is pleased to offer the complete RAL line in custom textures, low gloss / matte, and TGIC-Free Primid chemistries upon request. These Super Durable RAL coatings are in stock and ready to ship, in quantities as low as 5 pounds. Please contact your Sales Representative for more information, or simply email orders@powdertechnology.com to place an order. Visit www.powdertechnology.com to learn more about our RAL deck as well our entire product lineup. From our aggressive ATP and Anti-Chip primers to our Pentabond and Decabond top coats, as well as our anti-microbial and anti-graffiti coatings, Powder Technology continues to bring best of breed coating and service offerings to the marketplace. *If UL Listing is required, PTI must be notified upon receipt of the order to ensure proper documentation and packing, at no additional cost to the customer. PTI STOCK RAL SD TGIC Polyesters have been formulated to provide a high performance exterior coating when applied over a wide variety of substrates and surface preparations. They are based on a Low Cure Super Durable TGIC Polyester platform in order to provide a significantly higher level of UV resistance when compared to General Industrial grade polyester powder coatings. Listed under UL1332 DTOV2, RAL colors are available in Super Durable TGIC chemistry. Please call for more information. Individual products within this platform have been designed for uniform application properties and superior opacity levels. This platform has been designed for a lower temperature cure response, allowing for energy savings versus standard cure stock product lines.